Every musical season in South Florida brings with it a plenitude of concerti featuring the violin, the piano, and the cello, with an occasional clarinet or flute doing the honors. But it’s rare to hear a concerto for the horn, and so it was especially welcome Sunday to hear the next-to-last concert of the season by the Symphonia Boca Raton, which featured the well-known local hornist Gregory Miller in the Horn Concerto No. 3 (in E-flat, K. 447) of Mozart. 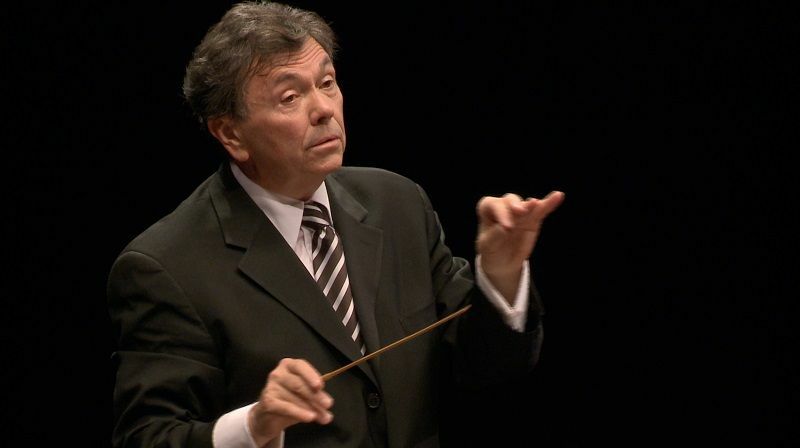 The Symphonia was led by conductor Gerard Schwarz, who now makes annual appearances with the orchestra, and indeed will be its first guest of the new season in December, when the former Seattle Symphony director will conduct a cello concerto movement of his own for his son, Julian. Miller’s playing is familiar to legions of local audiences from his seats in various area orchestras, and so it was a pleasure to hear him step out into a solo role. Miller has a big, confident sound, and a sure, impressive technique, so the acrobatics of this fine Mozart concerto posed no difficulties for him. He played with breadth and generosity throughout the concerto, and without a great deal of shade or contrast. The slow second movement was surpassingly warm without crossing the line into Romantic style, and the cor de chasse finale, sometimes approached as a lickety-split showoff number, was taken at a relatively leisurely pace, though it lost no effectiveness thereby. Schwarz proved a fine and sensitive accompanist, and it was a treat to hear this piece played so admirably well. The concert opened with another Mozart work in E-flat, his Symphony No. 39 (K. 543). I was late getting to the concert, so I missed the first movement, but came in right at the beginning of the second. This symphony is one of Mozart’s supreme masterpieces, and its raises unhappy thoughts about what new vistas he could have charted in this form had he lived past 35. Schwarz’s tempos were on the modest side, particularly in the finale, which went by good-naturedly at a regular Allegro rather than something swifter. He paid careful attention to dynamics, so that the sudden minor-key modulations in the slow movement and the finale stood out with the kind of operatic drama Mozart had in mind. The chief difficulty here was string intonation in the violins, which was occasionally iffy, and detracted from the overall effect. Mozart, almost more than any other composer, is treacherous with insufficient rehearsal, and here, another couple hours of sectionals would have been beneficial. The second half of the concert was devoted to 20th-century American music, beginning with the Concerto for Small Orchestra of David Diamond. Schwarz is perhaps best-known for his championing of Diamond during his time in Seattle, and this work, from 1940, showcases in its compact way the composer’s virtues: Melodic distinction, strong counterpoint, and a darkly colored, uncompromising byt accessible style. Schwarz carefully explained the signpost elements of the concerto in remarks to the large house at the Roberts Theater, and had the orchestra play those excerpts before performing the piece straight through. This is the kind of music that many of the still-neglected American composers of the mid-century were turning out: It’s distinctly modern, but also thoroughly tonal and conversant with its country’s then-popular styles. The Symphonia gave a strong reading of this short and powerful work, forcefully bringing out its martial cast and suffusing its lyrical contrasts with high emotion. The two fugal sections were nicely fluid, especially in the first of its two movements, when the choppy character of the fugal subject could engender a different result. The Symphonia played this score with extra strings, which were welcome, and with real accomplishment. Schwarz again made the most of its wide dynamic range, and made sure the deliberate stasis in the earlier pages of this music breathed and didn’t get short shrift in order to rush to the entrance of “Simple Gifts.” The Symphonia demonstrated effectively why this is a beloved piece of music, and the rapt audience at the theater gave it shouts of acclaim at the end.